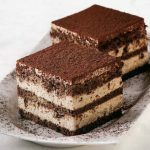 If you are craving for a tiramisu on your low carb and keto diet, this is the best solution. It has a perfect balance of flavors that will satisfy your sweet tooth. Heat oven to 350'F. Lightly spray an 8x8 inch baking pan with cooking spray. Using an electric mixer, in a large bowl beat the egg whites at high speed, with the cream of tartar and salt until stiff peaks form. About 5 minutes. Add 1/2 teaspoons of the vanilla extract and beat to combine. Add 1/3 cup sugar substitute and beat the mixture to form stiff peaks. Sift 2 tablespoons of the flour over the beaten egg whites and fold gently to incorporate. Repeat twice with remaining flour until all the flour is folded into the egg whites. Pour the batter into your prepared pan and gently smooth the top. Bake turning once half way through the cooking time until the cake is golden and the tester comes out clean. About 20 minutes. Cool completely. In a small bowl combine the ricotta, whipped topping, remaining 2 teaspoons sugar substitute, and remaining 1/4 teaspoon vanilla. Cut the cake in half vertically down the middle to make two 4 by 8 inch pieces. Place the halves on a flat work surface. Drizzle 2 tablespoons espresso onto each half. Spread half of the ricotta mixture onto one of the halves and dust with half of the cocoa powder and top with the remaining cake half; spread the top with the remaining ricotta mixture and dust with remaining cocoa powder. Using a serrated knife, gently cut cake crosswise into 4 slices and serve with mint leaves for garnish if using.